Road Tripping: Plans for Coyote Creek Trail would extend the paved roadway from Alviso down to Morgan Hill, making the Coyote the longest contiguous trail in Santa Clara County. THE SMELL of eucalyptus permeates the cold morning air at 4am. A San Jose running group is ready for its Saturday long-slow-distance training run at the Coyote Creek Trail. But the group is having second thoughts about lacing up. It's extremely dark at the bridge near the intersection of Hellyer Avenue and Palisade Drive--the main access at the usually busy, but now quiet, intersection. An obviously disappointed marathoner quips, "This place resembles The Blair Witch Project. There's no way in hell I'm doing this." For a group that has pushed the limits of human endurance, the trail's condition shouldn't be a deterrence, but running in the dark with zero visibility proves a difficult feat. They take their exercise to the streets. Their cars are left parked along Hellyer Avenue. While running, the complaints begin. The trail isn't lit. It smells like garbage. There are no water fountains. No bathrooms. The latter omission elicits laughter from the group. Several confess they've relieved themselves in bushes, trees and other trail covers. "It's not even ADA-approved," says one runner, referring to the Americans With Disabilities Act. On another day, a sunny, warm afternoon, 60-year-old San Jose resident Raymond Medina walks his dog, Sparky, along the trail. The retired electrician is recovering from knee-replacement surgery and needs the exercise. "I'm on the trail twice a day," he says. "I've always enjoyed it. I've never had any problems." Medina lives across the street from the park's ranger station and visitor center. "I feel safe walking here," Medina says. "It's gorgeous. Ever since they started closing the gates to prevent access after sunset, vandalism has gone down." He regrets, however, the occasional incidents of vandalism. "It angers me when people don't take pride in their neighborhoods. I see the garbage dumped, and it's disgusting. I wish more people would take more pride in their neighborhoods." Like a long and thin moving serpent, the developed portion of the Coyote Creek Trail--maintained by the Santa Clara County Parks and Recreation Department--follows the quiet Coyote Creek south from Hellyer Park for about 14 miles to Anderson Lake County Park. The asphalt path is relatively flat and meanders underneath walnut, oak, cottonwood, sycamore and California laurel trees. The organic oasis surprises city slickers who live in the congested and busy southeast side of San Jose. Once they try it, many trail users return. Despite the cracked asphalt, uprooted trees, garbage, vagrants and lack of water and facilities, most feel safer using the trail than dodging traffic in the streets. Cesar Fernando Elias, a park ranger at Hellyer County Park for almost five years, says he and other rangers patrol the county section of the trail. North of Hellyer Park belongs to the city, an undeveloped part of the trail with serious maintenance issues. He estimates that between 500 and 800 people travel some portion of Coyote Creek each week. "Usage has increased throughout the years, but as the weather improves, more people will use this trail," Elias says. "It's a nice thing to see." The county has made tepid attempts to improve the trail, the longest in the county, constructing a new parking lot at Silver Creek Valley Road and repaving sections between Silver Creek Valley Road and Hellyer Park and between Silver Creek Valley Road and Silicon Valley Boulevard. Though the 35-year-old ranger declined to comment on the city's trail portion--north from Yerba Buena Road to Tully Road--he speculates the county and the city may join forces to maintain and operate a larger trail system in the future. "We're right in the middle of suburbia, and here we have this strip of land [the park and trail] which is the last piece of nature that we have to protect. I feel pretty lucky that I get to protect that," Elias says, while driving his GMC green patrol truck. "The Coyote Creek Trail is one of the hidden secrets in this part of the county. It's not used as much as the other trails, but it's just as beautiful." Unfortunately, there's a dividing line between the county section of trail and the city's. Russell Westbrook, past president and founder of Walk San Jose--a citizens group dedicated to making San Jose safer for walkers and bikers--calls the trail's condition, in particular the undeveloped portion not in the county's jurisdiction, a classic case of "environmental racism." "There's no question that of all the trails in the area, the Coyote Creek Trail is one of the most neglected," he says. Westbrook says the trail is another example of East Side neglect. "Nobody is really taking an interest in it. If this trail was in Councilman Ken Yeager's district [which includes the tony Willow Glen area], it would have been improved a long time ago." Westbrook points not only to the garbage littering the Coyote but also to the years-long delay in extending the trail 2.5 miles from Story Road to Highway 101. "We've had politicians talking about this for three decades," he says. "This section of land is completely owned and managed by the city to build a greenbelt trail. It's really pathetic that in all that time not a single inch of trail has been completed." Aurelia Sanchez, a Spartan Keyes neighborhood activist, is eager to show the undeveloped trail on this end of the city. At the intersection of Keyes Street and Senter Road, she would like to see the city build a park. "We want to beautify the area," she says, while walking on a Union Pacific railroad bridge to access the city's undeveloped portion of the trail, across Kelley Park. Anyone found in this section of the trail is technically trespassing because, according to trail coordinator Yves Zsutty, the area is closed to the public. He explains that what appears to be trail is actually a service road for Santa Clara Valley Water District vehicles. District 3 Councilwoman Cindy Chavez disputes the environmental-justice allegation, saying other than Coyote Creek and Guadalupe River, the city has no other trail-related projects on the table. "I'm not sure what the genesis of that claim is," she says. Chavez agrees the county is better than the city at maintaining Coyote Creek. Chavez became familiar with the trail training for breast cancer walks. She knew when she was on the city side when she noticed all the garbage. "The difference between the two systems is glaring," she says. Chavez intends to ask councilmembers to rearrange priorities so the city does a better job maintaining its resources. She says trailblazers should see a difference by next spring. "We're the 11th-largest city in the country, but we're staffed like we're the 23rd largest," Chavez says. "Allocation of resources is by mile of trail, not by district," explains Zsutty, the trails coordinator. "If the Los Gatos trail is cleaner, that's because there are a lot of people using that trail. Coyote Creek is still in development stage. It has fewer users to kind of become advocates for the trail." Along with a focus on cleaning up Coyote Creek, the city is moving forward with extending the trail to Montague Expressway, meaning outdoor enthusiasts will be able to travel almost the entire length of the city without interruption of traffic. Three years ago, Walk San Jose, the Rails to Trails Conservancy and the San Jose government obtained an "environmental justice" planning grant for the Coyote Creek Trail from the California Department of Transportation. About $140,000 of the grant will pay for a feasibility study. 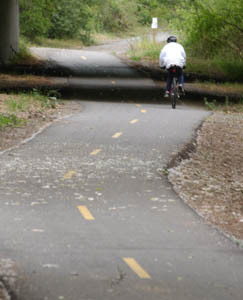 The proposed trail segment would extend northward from Watson Park, at Highway 101, to Kelley Park, at Story Road. Neighborhoods in the greater downtown and university area strongly support the project and have actively been involved in trail development meetings. On March 9, the San Jose City Council recommended that the Department of Parks, Recreation and Neighborhood Services seek state grant money to pay for the project and further development out to Montague Expressway, an additional four miles of trail. And another portion, from Phelan Avenue to Tully Road, has already been green-lighted through money from Proposition 40-- a $2.6 billion state bond measure for conservation, neighborhood parks and coastline and watershed protection. The proposed trail will connect four schools, offering children safe routes away from busy streets. There's already discussion of schools and parents organizing "walking school buses" where an adult supervises the children along a predetermined route. The trail segment will also connect five urban parks; Olinder Park, Williams Street Park, Kelley Park, Roosevelt Park and Watson Park. It would provide safer, more convenient pedestrian access to Kelley Park, the Happy Hollow Zoo and the Japanese Gardens. Yves Zsutty says he's also working on introducing gateways to help users easily identify the trail and its main access areas. Along the Coyote Creek Trail, he's considering banners, stones, podiums and any structure to draw attention to the future trail system--a sort of coming-out celebration for the trail. "The downtown has less open space than any other city district," Chavez laments. "The goal is to get the trail system connected to Alviso. We all have to work collaboratively to get this project going. It's a hidden treasure." Soon, no doubt, to be unveiled. From the April 21-27, 2004 issue of Metro, Silicon Valley's Weekly Newspaper.